Hal Freeman is an American-born Christian academic and blogger who made the ultimate statement by moving his entire family to the Russian provinces from the US a few years ago. His move became imminent after he realized that anti-family direction and propaganda rampant in the West, and which he feared would impair the moral development of his children. 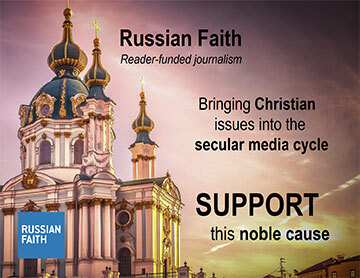 For more on his story visit his blog, which offers a fascinating window into life in Russia and describes how Christianity is transforming the country's culture, politics and lifestyle. Periodically I take a break from the heavier topics and write a blog in response to questions I have been asked about life here or details on moving to Russia. The questions usually come from folks who are either interested in moving here or others who are very interested for other personal reasons. So I try to think about the most frequently asked questions and respond. Of course, I am repeating some things I’ve already written. I hate doing that, but my readership sharply increased in January of this year for some reason, and many are Americans interested in details about a move to Russia. I can’t just tell new readers, “Oh, go back and read some of my old blogs—I’ve answered that question at some point.” Please forgive the repetition. I remind you (again) that my life in Russia is small-town Russia. Things are different in cities like St. Petersburg or Moscow. Some of my friends here in big cities may want to inform us of some differences. hen we arrived at our apartment building Oksana got the credit card out to pay while I took the kids and headed for the door. In a couple of minutes Oksana came and told me to take the kids on up. She’d be there in a few minutes. Sometimes the credit card machine has trouble reading the card in certain locations, so I thought that was it. We were in the apartment some time before she finally came up. I asked why it had taken so long. She told me the driver wanted to talk. He had questions. She said the he had a look of stark confusion for a moment. The idea that an American with no Russian ancestry wanted to live in Luga was a bit much for him. He still wanted to know why. Then he seemed to understand. He smiled and thanked her profusely for talking with him. It seemed to have made the driver’s day to find out some American guy wanted to move his family to his hometown! That doesn’t happen every day, but it is not atypical in a small town. Russians, to me anyway, seem torn between the need to be polite and even distant and, on the other hand, they want to know the details about our family. If at all possible, they will usually try to go around me and question Oksana, to make sure they won’t offend “the foreigner” with their curiosity. In our experience this questioning has never been with negative intent or with bad feelings toward us. When they find out I’m an American who wanted to move to Russia, who studies the Russian language and who is Russian Orthodox, they’re very interested. “Your wife is Russian. What about those of us who don’t have a Russian spouse?” I think it would be harder in some ways, of course. The “bureaucracy” would be the main problem. I mentioned I’ve applied for Temporary Residency since my three-year visa runs out next year, and I’m tired of having to go outside the country every six months anyway. The application process was a pain. Russians love documents, stamps, and anything that looks official. And God forbid you make a mistake and correct it on the form! And the lines you have to wait in to get them to look at your application are awful. Obama once said no one wants to emigrate to Russia, but then Barack Obama never had to wait in line at Immigration Services in St. Petersburg! According to the UN in 2013-15 Russia ranked 3rd in number of immigrants. Naturally, a lot is related to how well you and your spouse speak the language, but there is help if you are not fluent. I have an account with Sberbank, the main Russian bank. The local branch called the other day because Oksana had tried to pay her phone bill directly from my account. I had to verify it. They had someone in the office who was fluent in English speak with me. If you don’t speak any Russian at all, it will be a big problem, of course. But they will work with you even if you struggle and converse at a very basic level. Don’t be afraid to admit you don’t speak Russian well. In some circumstances I start by explaining I am a foreigner and sometimes have trouble with my Russian. It works. The Russians go into “help the poor foreigner” mode, and it usually ends well. I personally have never had anyone act frustrated because I am not fluent in Russian. Just the fact that I can express myself and what I need in Russian impresses them actually. They don’t expect an American to be able to say ANYTHING in Russian. But the principle remains: the better you know Russian, the easier it will be. This is especially true if neither husband or wife is Russian. You MUST be involved in studying the language, but you do not have to wait until you’re fluent. I think if husband and wife are both learning Russian together that is an advantage. You struggle together and correct each others mistakes. I have mentioned before I am very comfortable speaking Russian with my doctor because his English is so bad. I don’t mind making mistakes so I speak freely in Russian. When Oksana’s parents were here the other night I understood what was being said, but I held back from speaking because I knew it would slow down the conversation and Oksana can easily translate. So it does help having a spouse who is Russian and is fluent in both languages. Yet it has probably caused me to use her as a crutch and not get more practice. “How have you adjusted to the climate?” Since I’m from South Carolina both Russians and Americans ask me this question. Actually it is the easiest to answer: It hasn’t bothered me. I sometimes think people don’t believe me when I say that, but it’s true. I told my wife last week Sept. 22 always feels different for me in Russia. It is the first day of Autumn, and it actually feels like Autumn. It was mid-50s (F), kind of gray, and the leaves are changing colors. When it turned Fall in S.C., it never felt like Fall. Summer doesn’t let go that easy! As far as the winter in Russia, I prepare myself emotionally. It’s Russia, and it’s winter—therefore it is cold. They have nice warm winter clothes here, so it’s no big deal. I loved the climate in S.C. I used to water ski, swim, stay on the lake or at the beach as much as possible. But I always got excited those few times it did snow. And even after all these years in Russia, I’m still like a kid at the first snowfall. I love walking in the snow, playing with the kids in the snow, and then coming in to a nice warm apartment and watching it snow more. But nobody told us to declare and we had no way of knowing, so we ended up paying through the nose. Also if the paperwork on the American side is wrong, you’ll end paying a bundle in customs charges when your cargo arrives to Russia. So if you do ship, ask the company if they have ever shipped to Russia. It doesn’t matter how many other countries they’ve shipped to. Ask tough questions, and it will save you money. Also, we did not ship our car, but I was told by a friend who did that he could’ve bought a car the same make and model here for less than he he paid to ship his from America. The truth is Russia wants you to buy a car here, so custom fees are such that you may come out better buying here. We have not purchased a car because taxis and buses are plentiful and cheap. Furthermore, Russian drivers tend not drive defensively. If you do choose to buy a car the options are numerous, but the prices are no lower than in America. My general suggestion is that unless it is something you really have a strong emotional attachment to or something you know you cannot get anywhere else, then don’t ship. As I said, we live in a small town, but there was nothing we needed that we could not get here. It took some time on a couple of pieces of furniture because we had them built, but we got what we wanted. “What are the hardships of living in a small town in Russia?” I can’t really think of any hardships when it comes to living here. I mentioned the bureaucracy. That is my biggest problem, but I don’t call it a hardship because it isn’t like I have to do major paperwork all the time. Russia has changed in that we have plenty of grocery stores that have all you need at affordable prices; I love going to the open market for food and clothes; there are plenty of regular clothing stores as well. I know the Western media say sanctions are choking Russia and people are struggling. I’ve read several polls here and read a couple of fuller treatments that were carefully researched. In general about 2/3 of Russians say sanctions have not impacted them at all. Some in the lower poverty group (pensioners) say they have been negatively affected, as well as some who are very wealthy (foreign investors, etc.). Russian farmers love the sanctions. Farming is booming in Russia, and prices on produce remain low. “What are the best things about living in a small town in Russia?” There are several things that come to mind. First, I like the pace of living in a small town. We walk to the market or store or to meet friends. We enjoy our small church. We decided to put our children in public school. There are no Orthodox or private schools here, and we did not know at the time that you can homeschool in Russia. We do not regret it putting them in a public school, however. We have found the school does not try to take over our role as parents. Maybe he would get that attention in a big city school, but I know here he is watched over. He gets home no later than 1:30 (12:30 if there is no P.E. ), so he isn’t gone all day. The big payoff was he learned the language so quickly! We also personally know two families here who homeschool. That is becoming more popular here in Russia and is possible in a small town. Second, the medical care is high quality and low cost. I’ve written praising medical care here several times in my blogs and have answered a lot of private e-mails. We don’t have health insurance because we don’t think we need it. We pay about $7.50 for a regular appointment. Appointments are scheduled for 40 minutes. I have never had to wait in line more than 5 minutes. I’m in an on-line group of Americans living in Russia. I have known one American who had cancer surgery, another one who had major surgery, and both said they couldn’t believe how inexpensive their surgeries and treatments were—not even in the same ballpark as what it would’ve been in America. They were completely pleased with their care. I recently talked on-line with an American in St. Petersburg. We were trying to get together at some point and meet personally. He was recovering from a kidney transplant. It cost him NOTHING! I thought when he said it was free he meant the attending physician or surgeon. No, everything was free. He was applying for citizenship, but it hadn’t come through when his treatments began. I told him in America it took me forever to get the emergency room visits paid for when I had birthed two kidney stones. He got a TRANSPLANT and paid nothing. Also, emergency medical care is free for everyone. The quality and cost of medical care here is a huge benefit. The other advantage of small town life is the low cost of living in general. We checked on an apartment in St. Petersburg when we moved here because we thought we might want to live there. I can’t remember exactly, but I think it was about four times what we were paying for the same square meters here. The “dachniki” are the people from the big city who come here on the weekends (mostly in the summer). They frequent our grocery stores and market and buy all they can. We have heard them comment on how much cheaper it is here to buy groceries. “How much does it cost to live in your small town?” We live in a two bedroom apartment. It cost about $300 for the apartment and utilities. It is too small (about 60 square meters), but we’re OK for now since Roman our oldest son has an apartment in St. Petersburg. Since we don’t have a car we don’t really have any other major expenses. It is hard to give a figure on how much it would cost a family per month, because different families have different kinds of expenses. For instance, we know a family of six (husband and wife, a grandma and three kids) who live on $700 a month here (they own their property, so they have no mortgage or rent payments, no car payments either). It’s very tight and they have to be very wise about how they spend their money, but they’re managing. A decent house in Luga for a family our size cost about $50,000. Remember: Homes here tend to be smaller than in America. A new house about 1,500 square feet would probably be no more than $60,000. They told me since I am not a citizen I can’t get a loan, however. I took out part of my IRA for when we find the right house. “What kind of job could I get in Russia to support my family?”Since I don’t actually have an official job here, I’ll preface my remarks with saying my response is based on people I’ve talked to here. The two main areas that seem the most “convenient” is either teaching or some area of information technology. Native speakers of English find it easy to get students here. Here in Luga I could teach several classes at the private English school if I wanted to, and I could get as many private students as I wanted. The downside is the pay is sometimes not all that great, although if you build up your clientele of private students it can be pretty good. Also the i-net has opened up many more opportunities for teaching. Some people in Russia teach students in other countries in addition to their Russian students. I have a couple of friends in IT who moved here from America and still kept their overseas clients. They seem to do fine financially. Those are the two areas I know of in which you don’t really need to be fluent in Russian. Obviously, if your Russian is very good then you have more options with companies. “Does Putin or the Russian government in general make life hard on Americans there?” No. Some Russian laws are tough as far as immigration goes. Getting residency is aggravating, as I said. If I get my Temporary Residency I’ll be good for 3 years. Then I’ll apply for Permanent Residency, which is good for 5 years. After those 5 years I’d be eligible to apply for citizenship if I’m interested. If one wants to work here, then you have to get a work visa to start with and you have to pass your Russian exam! (There are agencies that help you do that). You’ll also have to live in the oblast (region) where you work. I didn’t bother with a work visa, since I’m retired, so I do not know all the issues involved. I’d think you’d have to have a Russian employer who takes care of things on this end. In general, however, the Russian government does not try to interfere with people’s lives nearly as much as the American government does. Nevertheless, we enjoy living in this town and in a culture wherein the values and beliefs we teach our children are not berated by the larger society. Despite what they say, the political situation here is far more stable than in America, and despite what you hear it isn’t run by a dictator. I sincerely grieve over the political and societal fragmentation in America. Mostly I think it is good for me to be here at home for my two younger children. I can do that on my Social Security without all the financial struggles we had in America.